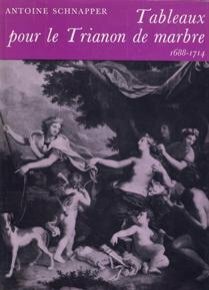 While Arthéna has published a new edition of Antoine Schnapper’s Jean Jouvenet , the RMN along with the Société des Amis de Versailles is now presenting a reedited version of an important book by this author, Tableaux pour le Trianon de marbre, with a careful updating by Nicolas Milovanic. This event should be commended as it provides fresh access to a study which has remained unchallenged. Furthermore, having first appeared over forty years ago, the original book offered only black and white illustrations which did not always do justice to the works. Still generally unknown, French painting from the late 17th century has not been studied, except in the case of a few artists, in the same way as that of the first half. Although Jouvenet, thanks to Antoine Schnapper himself, Antoine Coypel, Nicolas Bertin and Charles de La Fosse all found biographers, Michel II Corneille, Louis II de Boulogne, Bon Boullogne, François Verdier, René-Antoine Houasse, Noël Coypel himself, that is, the great majority of the painters of the Trianon, are still awaiting a monograph. The publication offers the rare chance of seeing good colour reproductions, in a book, of many of the works by François Verdier and René-Antoine Houasse who, of all these artists mentioned above, were until now the least studied. The first definitely appears to his advantage, far above his reputation based mainly on a countless number of drawings, many rather mediocre , René-Antoine Houasse will appear no doubt as someone to be rediscovered. Although Antoine Schnapper was critical of his skill as a draughtsman, he already emphasized “the elaborate charm of colours which play on grays, either blue or green”. This is indeed the impression when looking at these paintings with metallic, and particularly subtle, shades. His masterpiece in this category, perhaps one of the most beautiful paintings at Trianon, is Morpheus and Iris (ill. 1) in which Schnapper had pointed out its almost Neo-classical aspect, a hundred years ahead of its time. Updating another author’s work is not always a gratifying task and requires a certain degree of personal sacrifice. Nicolas Milovanovic has carried it off splendidly, at no time attempting to put himself forward and clarifying points further where needed. Indeed, we cannot help but admire the quality of Schnapper’s book by observing that over forty years later, none of his discoveries or attributions has been seriously questioned. Additions concern mainly the bibliography, the hanging of paintings which in many instances have returned to their original spots in the last few years and, above all, the discovery of lost canvases for which the author had predicted that some would eventually be recovered. So, while this new edition is a resounding success (moving those who have the original publication to wonder what they should do with it), we do regret however, in passing, that the book cover is so fragile (with no flaps, the corners are soon dog-eared). The original edition, even after long use, remains impeccable (ill. 2) ; the newer version may age much faster. Not illustrated originally, this restored painting is now reproduced. We would have liked to know which parts are original. Cat. I.6 and I.7 Louis II de Boullogne, Venus, Hymen and Cupids, and Venus and Adonis : in the original edition, the illustrations had been quite obviously reversed. Cat. 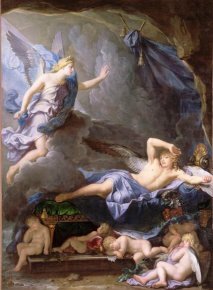 I.9 René-Antoine Houasse, Diana and Endymion : the painting is at the Narbonne museum and Antoine Schnapper explained that “the return to Versailles had not been possible.” It seems incredible that this painting has not returned after forty years. Cat. I.10 René-Antoine Houasse, Mercury and Argus : this painting was not reproduced in the original edition. Cat. 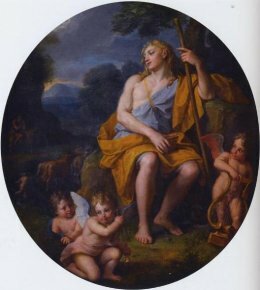 I.12 Charles de la Fosse, Diana and her Nymphs : the painting appeared to have been lost. It was “found again in 1995 in a restoration workshop where it had been sent [sic]”. Cat. I.22 and I.23 Michel II Corneille, two paintings representing children (also known as Evening and Night) ; they were not illustrated in the original edition. Cat. I.26 Noël Coypel, Apollo Keeping Admetus’ Herds (ill.3) : the painting was found only in 1987 and has been on deposit at Versailles since 1989. Cat. I.28 Antoine Coypel, Apollo and Daphne : the painting was found in 1968 and returned to Versailles. Cat. I.29 Michel II Corneille, Acis and Galatea : the same as above. Cat. I.55 Noël Coypel, Hercules Sacrificed to Jupiter : the painting was found at Versailles after the publication of the first edition. Cat. I.70 Michel II Corneille, Iris and Jupiter : this painting was not reproduced in the original edition. Cat. I.74 and I.75 Anonymous, Vertumnus and Pomona and Mars Resting : due no doubt to their poor condition at the time, these two paintings were not reproduced in the first edition. Cat. I.77 Louis II de Boullogne, Thalia and Erato : this painting was not reproduced in the original edition (re. preparatory drawings for this composition and cat. I.76, see news item of 20/5/06 in French). Cat. II.4 and II.5 Charles de La Fosse, Saint Luke and Saint Mark : neither of these paintings were reproduced in the first edition. The landscapes, particularly those by Jean Cotelle are not all illustrated, also the case in the first edition. This can probably be explained by the fact that they are well known and often reproduced. Numbers III.49 to III.51 are attributed by Antoine Schnapper to P. D. Martin (Martin the Younger) but in the new edition, the legend mentions Jean-Baptiste Martin without providing an explanation for this new attribution. Is it just a typo ? Ten flower paintings are reproduced, as opposed to only three in the original. Let us point out that the attribution to Antoine Monnoyer (the son of Jean-Baptiste) of numbers I.25 to I.28 about which Schnapper was very cautious has been maintained, as it appears that no additional information has been found. Antoine Schnapper, new updated edition by Nicolas Milovanovic, Tableaux pour le Trianon de marbre, 2010, RMN and Société des Amis de Versailles, 240 p., 49€. ISBN : 9782711855377. A review of this work will soon appear on our site.